If you’re a Mac user, and especially if you’ve been following my recent series of articles, you know that you can use Spotlight to find just about anything on a Mac. You can use Spotlight to find apps, files, web info, and more; using keywords, you can create complex queries to find that elusive file; and you can even use Spotlight to run advanced searches in Finder windows. iOS has its own version of Spotlight. While it’s more limited than the OS X version, you can still use it to find lots of things on your iPhone or iPad. 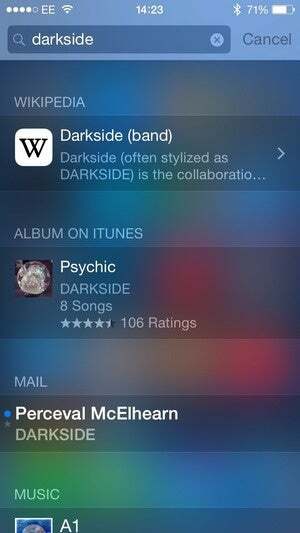 In this article, I’ll show you how you can use Spotlight to search for all kinds of data on your iPhone; how you can launch apps with just a few keystrokes; how to find and play music using Spotlight; and how you can set up Spotlight to only get the search results you want, instead of getting overwhelmed. Spotlight can search for many things on your iOS device, but it works a bit differently than it does on a Mac. 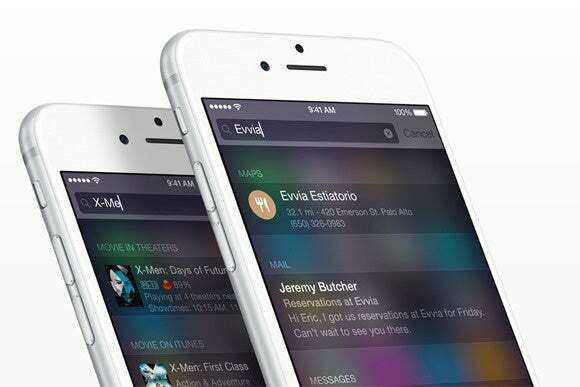 To launch Spotlight on an iOS device, swipe down on its screen. Don’t swipe from the very top of the screen; that displays Notification Center. Swipe anywhere else, and you’ll see the screen to the right. Start typing, and your iOS device will start showing you results, just as on OS X. As you continue typing, you’ll see the results change, as Spotlight zeroes in on what you’re looking for, showing you a number of different types of results. Spotlight search results. You can see a Wikipedia article, an album on the iTunes Store, an email message from my son about his favorite band, and some music all the way at the bottom of the screen. Tap an app to launch it; tap a song to play it; tap any other item, such as a contact, email message, or web page, to open it in the appropriate app. While I find Spotlight practical for launching an app that’s hidden in a folder on my iPhone, it’s even quicker to do so using Siri; just invoke Siri and say, “Open Notes.” However, you may not always want to do this out loud; in that case, Spotlight can save you time. 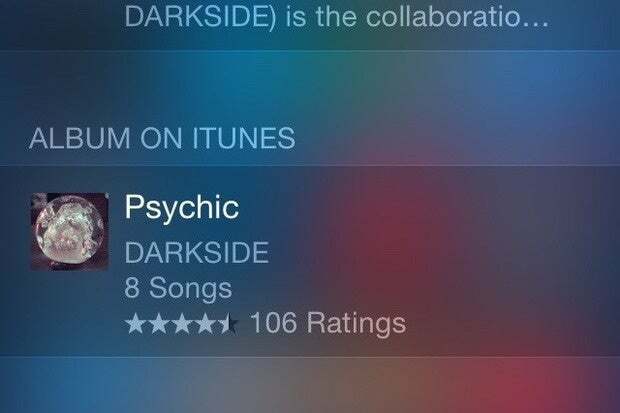 In addition, if you’re searching for music, Spotlight is good for digging up hard-to-find songs, but the Music app is even better. And for playing music, Siri has quite a few neat tricks, such as the ability to play a selected playlist, shuffle music, and much more. You can’t search for files, even those you’ve stored in iCloud Drive. 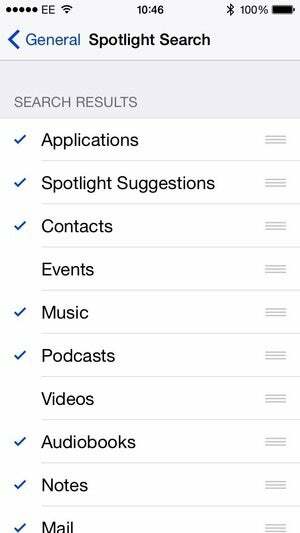 But you can search for the following: apps, contacts, calendar events, reminders, music, videos, audiobooks, and podcasts. You can also search for texts in emails and messages you’ve received. In addition, Spotlight can suggest web pages to view in Safari, Wikipedia pages, news articles, nearby places—such as hotels or restaurants—and content from the iTunes Store, App Store, and iBooks Store. Choose which categories you want Spotlight to search, and change the order in which they display. You may not want to see all these search results. Just as you can do with Spotlight on OS X, you can choose which categories Spotlight displays when you search. 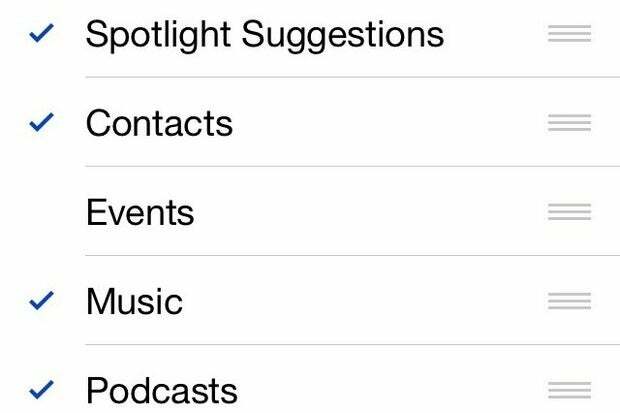 Go to Settings > General > Spotlight Search and check or uncheck any of the categories you see. You can also change the order in which they display. To do this, tap and hold one of the rows and drag it up or down in the list. Email: Spotlight searches for senders, recipients, and subjects, but not for text in emails themselves. You can search email texts in the Mail app, however. Spotlight can also search Mail for dates, flags, or unread status. So if you want to find the latest email from a specific person, Spotlight will help you out; but if you want to search for keywords in your emails, you need to switch to the Mail app. 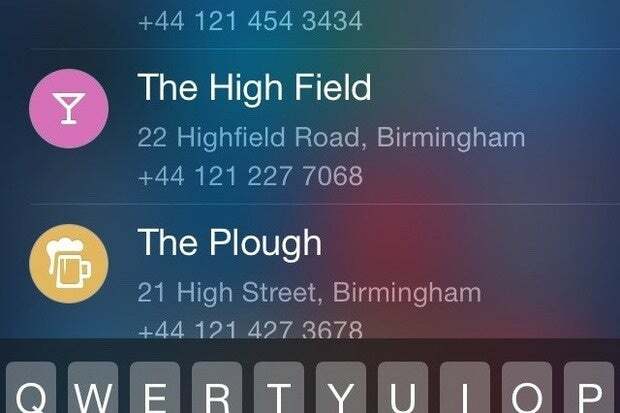 Contacts: Spotlight can search for names, addresses, email addresses, phone numbers, and notes about your contacts. You can open contact cards by tapping one of the results. Calendar events and Reminders: You can search of the titles of calendar events and reminders, and Spotlight searches one year in the past, and one year in the future. As with contacts, tap a result to open it in the corresponding app. Messages: Search for sender names, and for specific text strings within your messages. Tap a result to open that text message. Music, Videos, Podcasts, and Audiobooks: Search for a song, album, or artist name. Tap one of the results to start watching or playing the item. As I mentioned above, Spotlight can also search for content on the Internet. It will suggest matches from search terms among Wikipedia articles, news, content on the iTunes Store, App Store, and iBooks Store, as well as nearby places. These searches fall under the Spotlight Suggestions category. 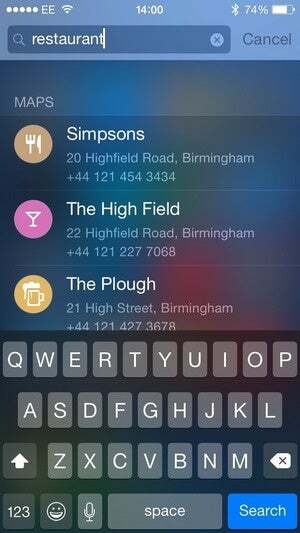 Search for restaurants, hotels, bars, museums, and more places near your current location. Depending on what you want to find, these results may or may not be useful; and they may not be any more useful than what Siri can find for you. If they just clutter your search results, turn them off, or move them down in the list. Note that for nearby places to work, you need to have Location Services turned on in the Privacy settings. I explained that you can choose which categories display when you search Spotlight. It’s a good idea to find what’s most useful, and turn off the categories that get in the way. I don’t search my email in Spotlight, and I have Spotlight Suggestions turned off, unless I’m away from home, and plan to search for a place to eat. Over time, you’ll figure out the most efficient way to use Spotlight on your iOS device. And you’ll be able to find almost anything on your iPhone, with just a few taps.